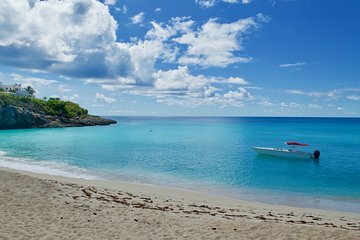 Venture out from St. Maarten to the island of Anguilla on your own private speedboat. Charter a boat for the day and customize your own itinerary with the captain based on your interests and the weather conditions. Snorkel in the vibrant coral reef systems to discover native marine species, swim in the pristine turquoise waters, and soak up the warm Caribbean sun with a drink on hand. Sam and Mel were fantastic! They met us at the dock with hot coffee and croissants. We had a little paperwork to fill out before we departed and they took care of all of that. They took us to some fabulous spots in and around Anguilla including a wonderful place to eat lunch. They had plenty of drinks (including rum punch) and were very accommodating to our group. I highly recommend this as you are free to choose your itinerary. Great private tour of Anguilla beaches which was the highlight of our St. Maarten vacation.